So the sampler proceeds apace. I'm not sure exactly how many blocks we're going to have at the end. I'm at that stage of quilting where nothing looks good and I wonder if it's worth finishing, but I go through this with each of my quilts. I'll just keep my fingers crossed and hope for the best! And, just for fun, I'll leave you with a little movie of my dog, Susie, who loves having her ears tickled. This is nothing to do with quilting, but I had to repost this video made by the employees of the St. Vincent Medical Center in Portland Oregon in support of breast cancer awareness, which I first saw on Carol's blog. Ladies, don't neglect your annual physical and your mammogram, if consistent with your doctor's advice. In other news, my friend and colleague, Clare, is visiting from the UK. We have some work to do on a joint research project this week, but we also enjoy hanging out and eating good food and drinking good wine. Clare and her partner, Nigel, are getting married in April. 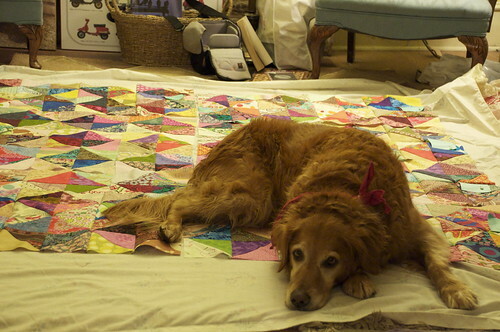 I plan to make a quilt for them (she doesn't know about this blog, so I can speak frankly), but there's a small problem. Clare is a (social) scientist, but she has one area of superstition: she doesn't wear green. Ever. Green is bad luck. It's a superstition she inherited from her mum. I gather that she broke out when she was a younger woman and wore green for awhile, but then had a string of unhappy events. So green got the boot. I'd love to make her a bright, cheery quilt, but with modern fabrics, and I have three layer cakes that would be perfect raw material. But most fabric lines have at least some green, and these layer cakes all do. My task this week is to suss out whether green is verboten only in clothes, or whether the ban extends to home decor items, like quilts, as well. I shall put on my special spy outfit - wish me luck! Those Aussies are so much fun. Today I'm playing Pip's My Place and Yours meme, where one makes a post in keeping with a set theme. The theme is set by a blogger who posted in the previous week's theme. The theme this week is "My Collection", set by Kate. Kate wanted to know the story behind our collection, were there rules for new acquisitions, is the collection complete, does it have to be second hand or a gift, and so on. I don't really collect anything formally. We have a tiny, tiny house, just big enough for the three of us and our two dogs. You'll believe how tiny it is when I tell you that we only have one bathroom! Point is, there's no room for a collection of any kind! 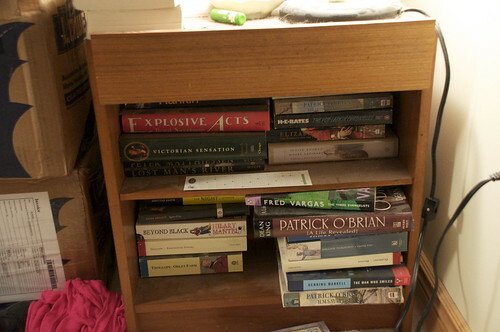 However, I do have books. 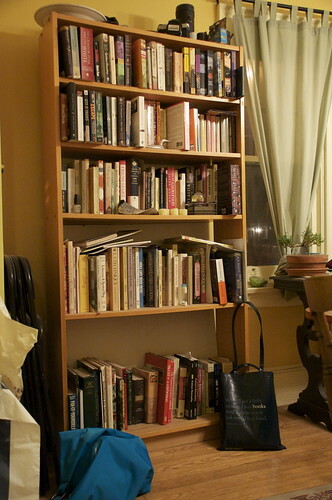 Too many books, if you ask my husband (which I never do, I might add). 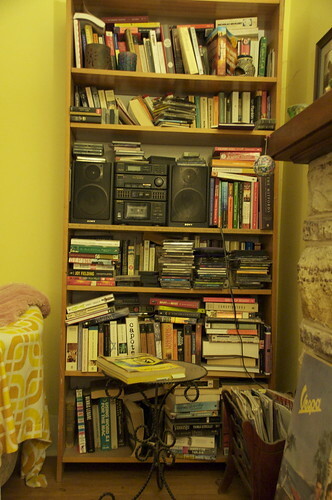 And I have a great deal of difficulty letting books go. I never feel so rich as when I have a stack of books I haven't read. As I mentioned in a previous post, I rise early enough to read for an hour before I have to start my day in earnest. I read in several different genres: murders and spies, biographies and memoirs, classic and contemporary fiction are my favourites. I have e-books from Project Gutenberg on my iPhone; right now I'm re-reading Gone With the Wind. It's a small format, admittedly, but it's great to pull out when I'm in the car, waiting for my husband to come out of the bank or the pharmacy. Still, I prefer the actual printed book over the electronic versions - no Kindle for me! My absolute favourite author is Patrick O'Brian, who wrote a 20-novel series about the British Navy during the Napoleonic Wars. You may remember the movie based on one of those books: Master and Commander, starring Russell Crowe. These are total boy books, but so well-written and fascinatingly historical. I hardly ever meet anyone who has read them, but whenever I do, we exchange a secret handshake! When I was a young child, my parents were both in university. We lived in the student area of town, so there weren't many children for me to play with. My brother came along when I was five, but he was too young to be interesting. (He reads this blog, so I must state that he is very interesting now.) We didn't have a television until I was nine. So my chief entertainment was books. 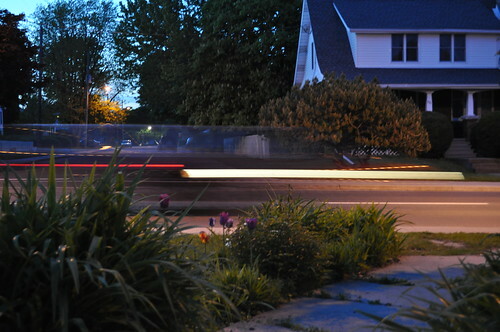 By the time we came to live in neighbourhoods that were more family-oriented, my habit of reading was set. Fast forward 40 years, and here I am a professor of education and psychology, whose research delves into how children learn to read and why some of them struggle to do so. Maybe my "collection" isn't really a collection, since it doesn't really have rules for new acquisitions or special parameters of any kind. But if having a collection makes you feel like you always need one more, and you can't bear to part with a single one, then my collection makes the grade! 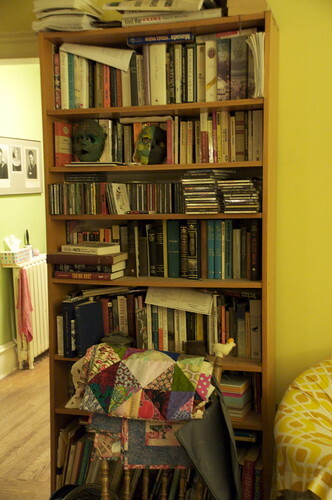 People collect all kinds of things - you can go look at some of these linked from Pip's blog. What do you collect? I find Sew-n-Tell Fridays so motivating! 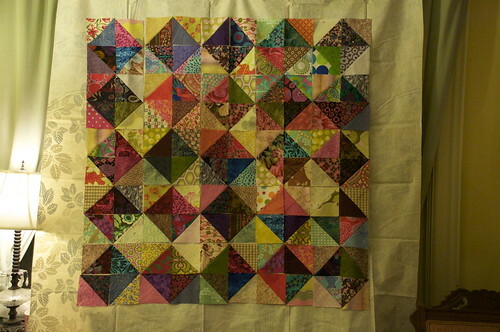 Last night I finished piecing my Values quilt top so that I could post over on Amy's this morning. 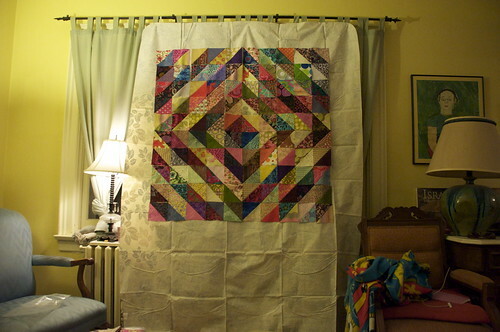 It was a shlep, actually, since the quilt turned out larger than I expected, too big for my McGyvered design wall. So I laid it out on the floor. But look what happened. This was actually kind of cute. Susie has always been a lie-on - she makes a bed out of whatever she finds on the floor. But when she started to make a nest, she had to be booted off. Fortunately, most of these blocks were already sewn into 4 x 16 panels. These inside-at-night photos are pretty bad - they're all taken without the flash - please forgive. It rained all night and was overcast this morning when I hung the quilt top on the line, but the colours still come through, I think. My daughter loves this quilt. When she saw all the layouts up on the design wall, she absolutely rhapsodized over this one, and began begging me to let her have it. I made the Blue Meanies for her, but she doesn't like it nearly as much as she likes this one. I also love it, and particularly I love how many different layouts are possible, each one giving a completely different look. I've resolved that all my future projects will contribute a 6" square of fabric, so that I can start to build up scraps for more of these great quilts. Thanks to Katie for leading this quiltalong - I don't think I would have considered doing it otherwise, and now I'm hooked! I've not yet decided what I want to do about the back. Eve put the kibosh on my idea of having a pieced back with some 12" diamonds in the same light-dark pattern as on the front. There is some danger in letting your teenage daughter have any decision making power - they only want more and more! Thought I'd leave you with a little video which inspired the title of this post. When I hung the quilt out on the line for a photo, the wind picked it up and blew it around. I find that such a compelling, almost hypnotic sight. 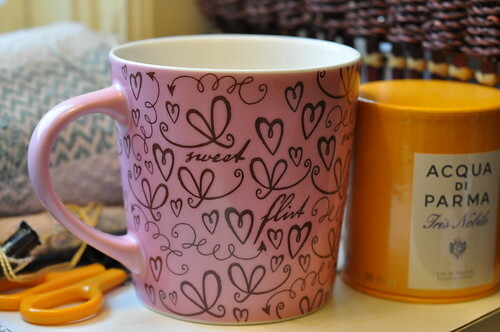 In other news, SewTakeaHike is hosting a Flea Market Fancy giveaway until the end of the month. And the Incredible Shrinking Quilters' Bee is fully subscribed! Woot! You'll be seeing a lot less of me in the coming year, with the blessing. And I mean that literally, as the twelve of us will be working towards reducing, as well as making awesome quilts for each other! Have a great weekend, everyone, and don't forget to go over to Amy's and cheer on the other Friday finishers! Friends, in October, 2010, I will turn 50 years old. I have a big milestone to reach, and as of today I have not taken a single step. That milestone is the shedding of some significant personal poundage. I do not want to reach the age of 50 shlepping this extra avoirdupois! 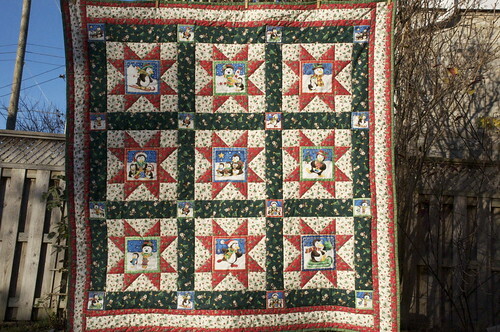 I was thinking it would be awfully nice to have some company along the way, and do some quilting into the bargain. So what do you think, y'all? 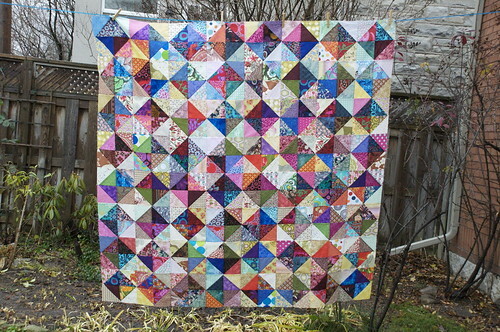 Are there any takers for slots in an Incredible Shrinking Quilters Bee? Join up if you, too, want to lose some weight and get fit in 2010 and make some quilt blocks to help us all mark achieving an important and healthy goal. Many hands make light work - plus, you can't eat if you're quilting! If you're interested, leave a comment below and I'll contact you by email. I'll leave this open to readers of my blog right now, and if we need more participants, I'll post over at the Flickr bee group. 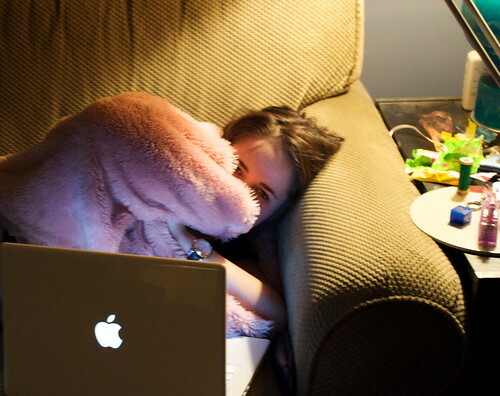 Amy over at Park City Girl invited her blog readers to describe a typical day. I was astonished (again) at how much she accomplishes with four young children at home. It made me ashamed to think how often I exclaim how busy I am and how I am too pressed to do this, that and the other thing. When, actually, I lead a life of comparative luxury, timewise. Let me tell you about my typical weekday. Here's a photo from my front door when I go to retrieve the newspaper in the morning (obviously taken earlier in the year). Early risers, my husband and I usually get up around 5.30. He does the dishes from the night before. I know that sounds terrible, but early on in our marriage, this is how we lay out the ground rules. I wanted to wash the dishes after dinner, like normal people, and I wanted him to take his turn, especially if I had made dinner. He had no objection to washing the dishes, but he didn't want to do them after dinner. If I wanted an empty sink before bed, he said, I'd have to do it myself. Well, I said, arms akimbo and ready for fighting, there's no way I'll be found washing dishes from the night before. That's fine, said he, I'll do it. And so he has done, for twenty-three years. Every morning before the crack of dawn, he's got CBC radio on, washing the dishes. I know, right? The dishes thing alone has guaranteed him contract renewal - but wait, there's more. He also cleans house. Myself, I love a leisurely wake-up. I make myself a cup of coffee and sit with my computer, the paper or a murder novel. Sometimes I look at on-line fabric shops. That's often a big mistake. I'm very vulnerable so early in the morning. The coffee hasn't made its way fully into my brain and I do silly things that involve my credit card. My 16-year old daughter has her own alarm clock and is supposed to be responsible for getting herself up and ready for school. Sometimes that happens. But even if I have to lever her out of bed with a crowbar, she's pretty independent afterwards. She can change her clothes three times, make herself some cereal with half a cup of sugar and cover every inch of the bathroom counter with cosmetics without my help. And she's off to school by 8.10. I don't really get out the door before 9.30. I'm grateful for the Indian summer we're having now, since I can still ride my Vespa motorscooter to work. Each year, I try to hold out until the end of November. 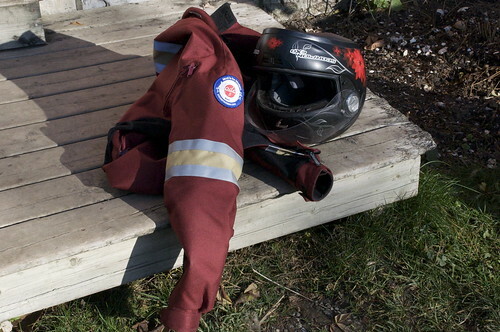 I wear an armoured jacket and a full-face helmet. Some people think that's a bit over the top for a scooter, but its top speed is 100kph, fast enough to hurt if I fall off, and the tarmac doesn't magically become soft just because my scooter isn't a Harley. But strictly speaking, I shouldn't be using a power vehicle at all - I can walk from home to my office in 13 minutes. 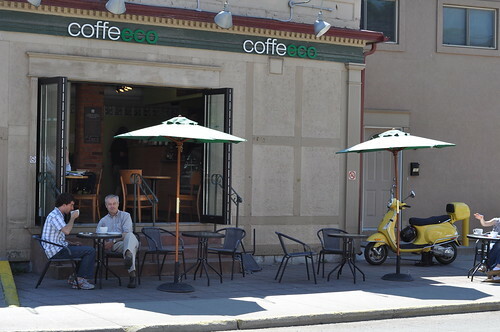 From April to December, the scooter months, my first stop is a local cafe near campus which I call my Summer Office. This photo was obviously taken in the summer - and there's Arletta, my yellow Vespa. I often meet my lab manager here, and we talk about our research and the students. We sometimes stray onto the topic of quilting, as well. 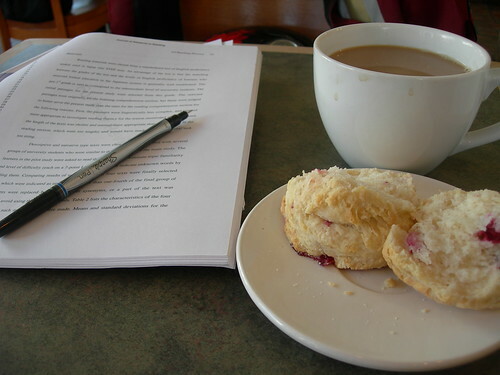 I always order the same thing: a 16 ounce coffee and a cranberry tea biscuit. And most of the time I get some work done: reviewing journal articles, marking papers, writing up research papers. I'm usually at work at the university by 11. Here's my lab. 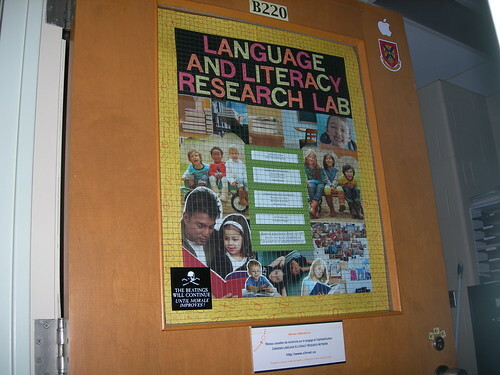 We do research in reading development and reading difficulties. If you want to know more about what we do, check us out. Notice the disco ball. Lindsay made homemade marshmallows; they're on the table beside the faux orchid and they were AWESOME. But that wasn't enough sugar for us. 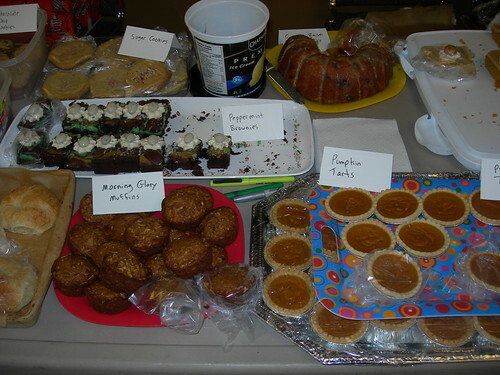 Thank goodness for the bake sale down in the lobby! Today was a teaching day for me. I had a class of B.Ed. students who are enrolled in a course on the psychology of learning difficulties. Today they were giving presentations on specific types of special learning needs. They did a great job. They're going to be great teachers. When I got home, I was greeted by my gorgeous daughter. You'll have to take my word for it - she was doing her Greta Garbo impersonation for this photo. 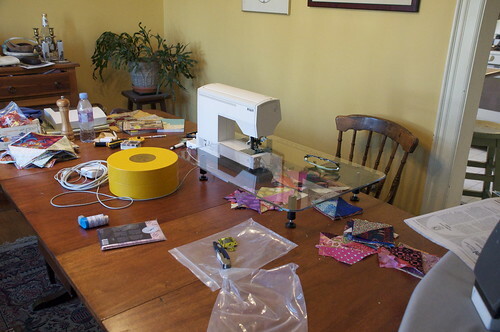 I try to tidy up my sewing outfit from day to day, since I am stationed on the dining room table. But last night I was too tired, and this morning I was too busy keeping online fabric shops in business. So I had to do it before dinner. When I'm working on something, I usually have my laptop on top of the yellow Aqua Di Parma box, watching movies. My husband and I shared some time in the kitchen getting ready for dinner. Tonight we had marinated chicken breasts, steamed zucchini and baked acorn squash. 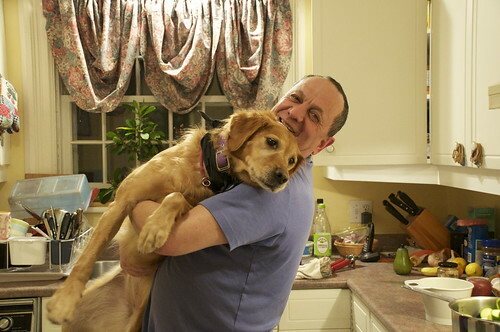 We always have company when we're making dinner: our dog, Darla, is a slave to her stomach and can always be counted on to hoover up anything that falls. We have another dog, Susie, who has figured out that the odds of having food drop into your mouth in a crowded kitchen are worse than the odds of getting your tail stepped on. In the interests of fairness, I'll show a photo of her, as well. 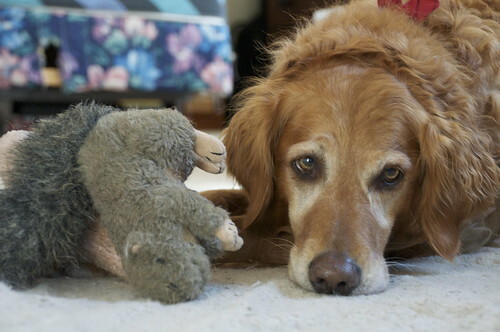 How she cherishes her little squirrel. Her chief feature of interest is that she smiles in greeting, shows her full set of choppers. It's a bit off-putting to newcomers, but we love it. And now dinner is over, and I'm going to go drag my husband to the television for an episode of old BBC series The Duchess of Duke Street. I think there's still some Halloween candy, too. DSC_0001, originally uploaded by Shadrach Meshach & Abednego. 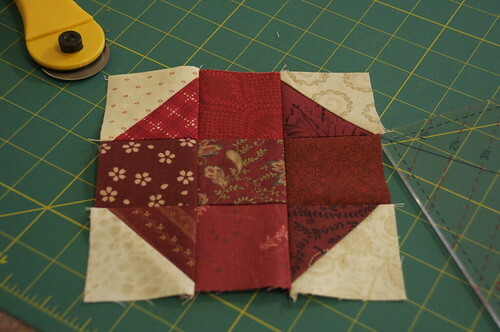 Yesterday I began to make blocks for the Modify Tradition sampler quiltalong. I am shockingly late to the party, but that seems to be a theme in my life! It's always odd to start a sampler because until you make a good number of the blocks they don't seem to hang together. In fact, here's a secret: I hate samplers. So the challenge for me in this is less melding traditional and modern, and more actually making a sampler that I fancy a wee bit. I like my fabric choices, so I'll just have faith they will all come together. I especially love that big floral in the block above and how it opens up the space. This star turned out to be much lower contrast than I expected. 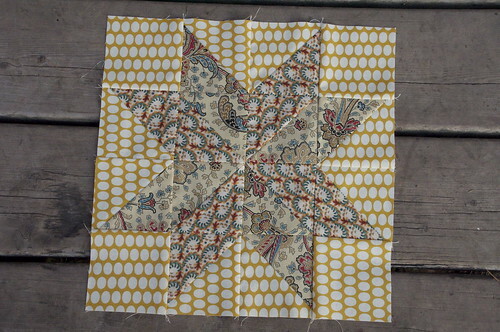 If I have extra fabric at the end, I'll make another one with higher contrast between the points of the star. And I completely ignored the fact that those eggs in the background fabric were actually directional and now look kind of odd. 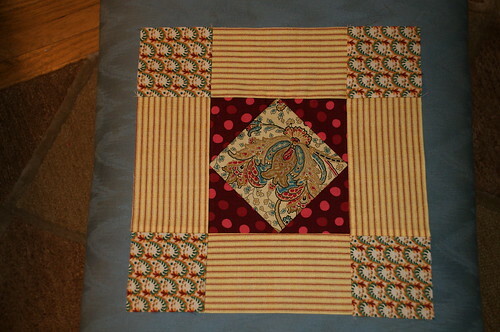 But this block is nice - with a couple of borders it could be a nice pillow, if it doesn't end up in the sampler. But the benefit to having unequal block sizes is that you can also have rows of unequal sizes. I like the idea of using the smaller blocks between the larger blocks, like this. 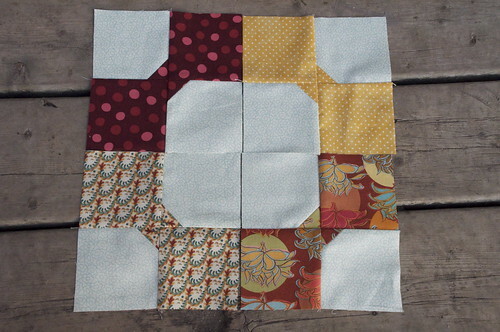 Also, I plan to use simple, unpieced setting blocks in the smaller size to open up the visual space in the quilt and make it less busy - but I'll need to wait to cut those until I get more blocks finished, in order to husband my fabric appropriately. And somehow, I forgot to snap a photo of the nine-patch blocks alone. Here's as close as I managed to get. 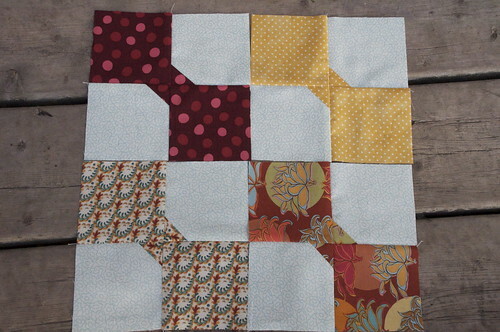 Setting them out like this shows me what fabrics should get featured in the subsequent blocks. For example, whatever comes next should pull in that turquoise in the lower nine-patch. Well, I don't know if these are modern or traditional anymore. I feel mind-boggled by that whole discussion. 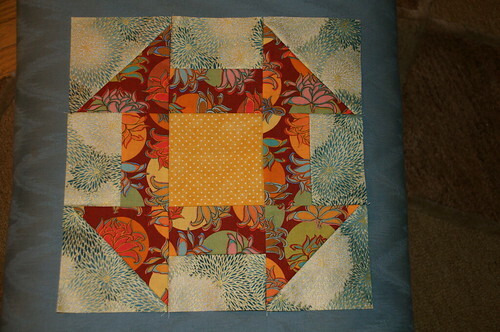 What I do know is that by choosing to use large and small blocks together I think I can make a sampler that I'll like. At any rate, it's going to be interesting to see it come together. I think I'm caught up now; bring it on, Jennifer and Crystal! 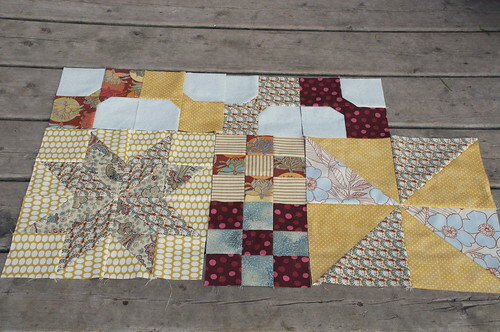 In the meantime, I'll work on sewing together the blocks for the Values Quilt. Woot! I got my first two packages for the Snowball Swap today! From Texas and North Carolina! Thanks, team! I've joined up with eleven other women to participate in a quilting bee in the new year. You can see the button over in the sidebar - it links to our Flickr group, which is empty as of now. 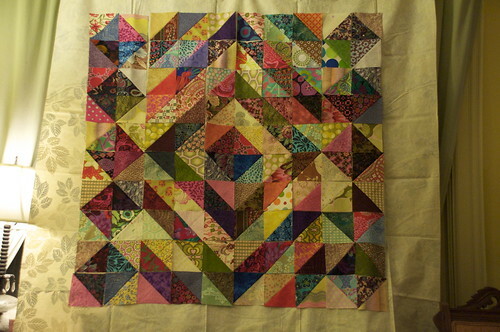 So is our blog, but watch this space, because I'm sure we'll be creating some spectacular quilts. This bee was inspired by the very interesting blog and quiltalong led by Jennifer and Crystal over at Modified Tradition. In an online bee, every participant has a particular month in which they send out fabric and instructions to the other members of the bee, who in turn each create one or two blocks for that month's member. Members in our bee are mainly from the U.S., but there are three "foreigners" - that would be me and Leanne from Canada, and Sandra, a lovely lady from the UK. I've listed the members who have introduced themselves to the group over on the sidebar, as well. My month isn't until March, but I've been thinking about the pattern that I'd like to choose for my blocks. I've always really liked Lady of the Lake, and I think there's a lot of scope in this pattern for making it look new by setting it on point and using modern fabric. I must be a masochist for half-square triangles, because I also really like the Sawtooth block. 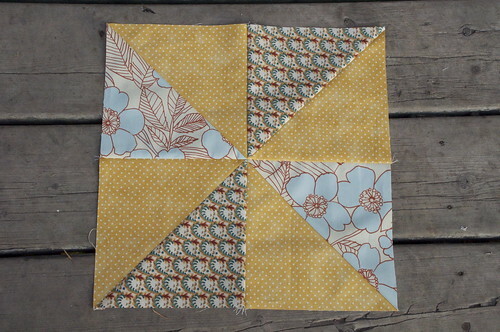 The use of setting blocks, like in this photo, means you can make a good sized quilt from relatively few pieced blocks; this is good news for a bee, where you will get 22 blocks at most, or maybe only 11, depending on the rules of the bee. 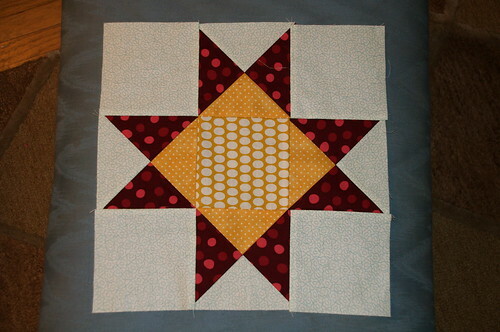 Another way to manage this is to choose a pattern like the Ohio Star in a particular largish size for the bee blocks, then make the same block in one-quarter size to add to the size of the quilt. This has the added advantage of showcasing the bee blocks due to their relative size, and the difference in block sizes make it look new and modern, even though the block itself is traditional. These are my preliminary musings, and I'm looking forward to clearing my WIP pile so that I can think about this new project with a guiltless heart! thank goodness, it doesn't start until 2010! *This isn't "due" until January 2010, so technically it shouldn't count in the 2009 WIPs. That's why there are actually eight projects on that list. Anyway, that's my story and I'm sticking to it! 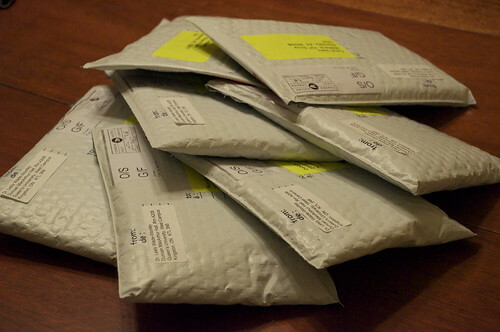 At least one of these is going out to the long-armer. I'll count it as "finished" once it leaves my house. Can she do it, folks? Stay tuned and find out! I'm so excited to show you my solution to the design wall problem. It's a bit McGyvered, but it's effective. I bought a flannel-backed, vinyl tablecloth at the grocery store and pinned it to my living room curtains. The folds in the vinyl are pretty pronounced, but it lays flat enough to do the job. Please ignore the SpongeBob fleece blanket on the chair to the right. I had originally planned to use that, since fleece holds blocks like a magnet, but I knew I couldn't overcome the distraction of those googly eyes. My daughter took that blanket to camp when she was nine, and we haven't managed to get rid of it yet. I played around with some of the layouts that are possible with these blocks. Again, I have about twice as many blocks as are shown here. Here is a closer view of the one in the picture showing the design wall, #1 - it's the traditional, radiating diamonds layout. In #2, the radiating diamonds are bounded on the sides by small diamonds. More of the radiating diamonds would be complete in the full-sized quilt, and I think that may make it look less busy than it does right now. Busy in a bad way. Here's #3, where there is one large diamond, surrounded by small diamonds. I think it looks less busy than the one above. 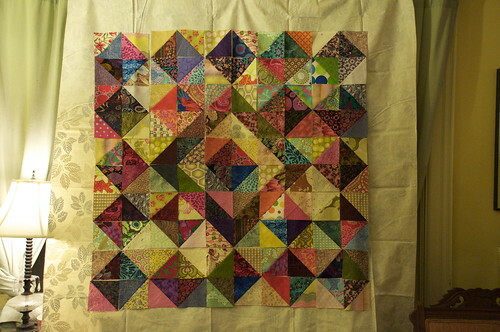 I like the layout when the quilt is this size, but I think it might look off kilter when it's full-sized. 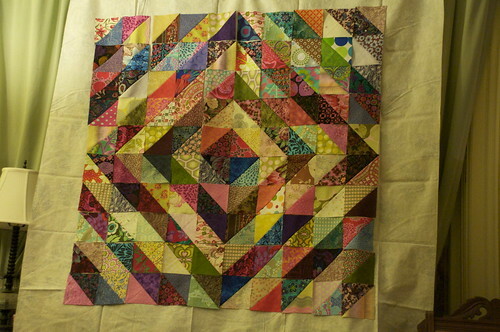 When all the blocks are in, I suppose I could add another radiating diamond to keep the pattern balanced. This is #4, the final option: small diamonds in an all-over pattern. I like this one, too. Decisions, decisions. Which one do you like? VAlues blocks, originally uploaded by Shadrach Meshach & Abednego. Boo hoo - it's Friday and I have nothing to share over at Amy's Sew-n-Tell sisterhood. 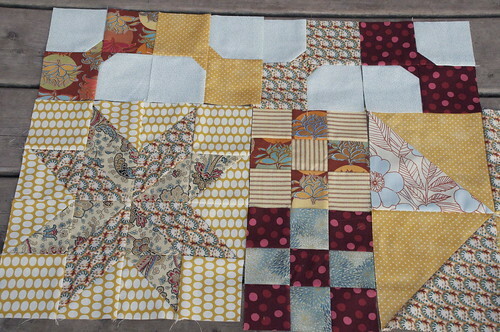 But rather than not post at all, I couldn't resist laying out some of my blocks for the Values quilt, because they are all trimmed and ready to be pieced, and because the colours are so pretty. These are just a few of the blocks - this quilt is going to be bigger than I realized - not massive, but fairly substantially sized. 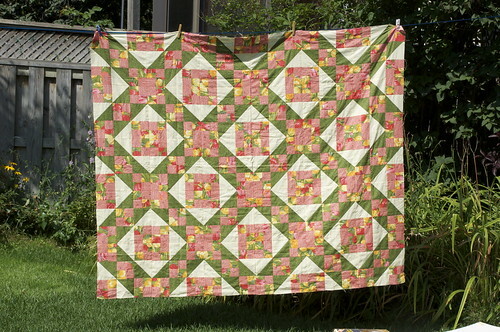 Katie, the brainchild behind this quiltalong, calls hers "Mine, All Mine", and I can completely relate to that, since I have all kinds of scraps in here from quilts that have been gifted. It's a nice reminder of all that work that I did. This was completely unstudied - whatever blocks came to hand. 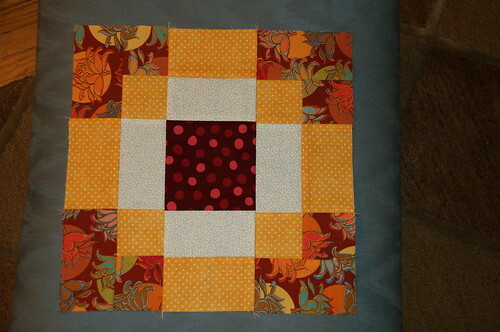 I think I can do a better job of matching blocks to emphasize the dark/light contrast. And this probably will not be the layout that I go with (but who knows). However, I just wanted to post something to show that I'm still slogging along! Fingers crossed, I'll have something more substantial to show next week. Update: Seriously, what the heck? Today before noon, three of the blogs on my feed reader make reference to French General's Rouenneries line. I have been steadfastly resisting succumbing to this drop-dead gorgeous line of fabrics, but clearly, this is an omen, a message to me: "Get thee to the online fabric store." Who am I to argue with a message from the beyond? Update re: update: I ordered one layer cake and two charm packs of Rouenneries from Hancocks of Paducah, and then saw that they had Erin McMorris' Wildwood line on sale for $5 a yard. Here in Canada we pay at least double that. After a brief struggle with my conscience, I convinced myself that I already do plenty to keep my LQS in business. Woe is my credit card. I started cutting my fabric for the snowball challenge last night. Honestly, over the last week it feels like I have been chained to the cutting mat! I was determined to make one red snowball last night. 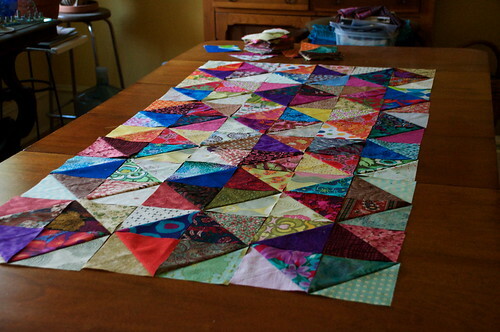 It's mainly strip piecing and half square triangles. I thought I'd show you a couple of tools that I use in my quilting. 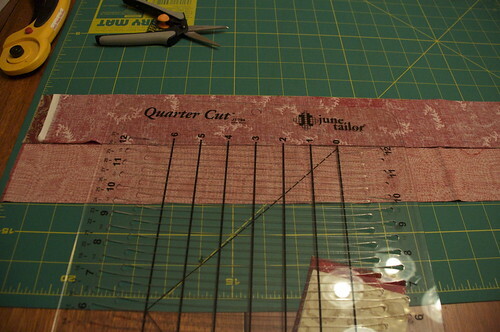 Here's a slotted mat from June Tailor that I use for cutting strips. You fold the fabric selvage to selvage, then twice more after that, so that you are cutting through eight layers of fabric. Your cutter needs to be sharp for this! There's a line to lay against the fold at the bottom, and a zero mark to slice off the end and make a clean beginning. The slots are marked off in quarter-inch segments, so it's useful for most sizes of strips. After you cut the strips, you can turn them sideways and cut squares or rectangles, as well. If you are careful about the original folding, you can cut nice strips with no Ms or Ws at the folds. 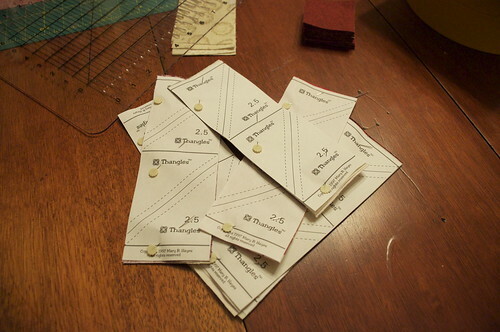 These are Thangles; they are paper guides used for making half-square triangles. 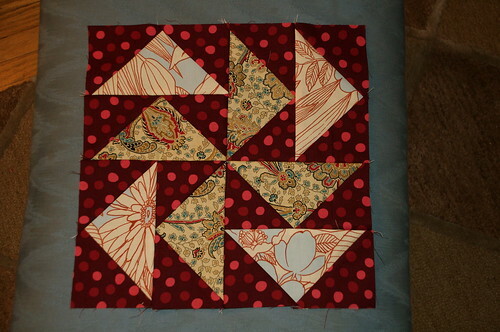 Layer the right sides of fabric together, pin carefully; sew along the dotted lines and cut along the solid lines. Press open, peel off the paper, trim to size. 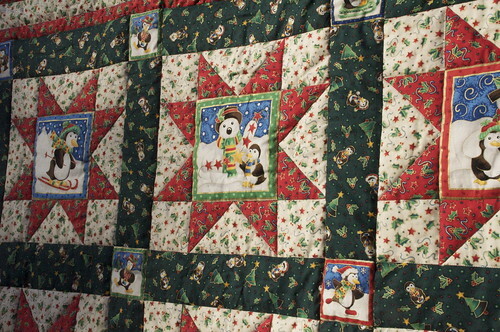 The drawback to these is that it is terribly tedious to pick the paper off, but to be fair, the paper used for these is one of the easier quilting papers to remove. At least, in my experience. Thangles (and other brands that use the same approach) stabilize the HSTs when pressing open along the bias, and produce dead accurate measurements. Here is my first snowball. It's fairly small, 6" inches. This quilt is definitely going to be the most traditional-looking piece I've made since I've rejoined the quilting world. I think it's going to be a great winter quilt. I've already bought a wool batt for it (directions say it can be machine washed, laid flat to dry), and I plan to use a nice flannel for the back. It's not going to win any prizes for modern design, but it's going to feel like the quilt equivalent to mac and cheese! Mmmm.... comfort food quilting! For all you Snowball Challengers in my swap group, watch your mailbox. I finally sent these off, with a little surprise inside!